Astronomers believe a bright dwarf galaxy relatively close to Earth’s Milky Way and trailing fireballs is the first clear example of a galaxy in the act of dying. The galaxy, in the Virgo Cluster, is called IC3418. Here is a false-color ultraviolet image of the dwarf galaxy IC3418 with its ram-pressure-stripped tail of young stars (from the GALEX satellite), shown on a false-color X-Ray image of the Virgo cluster, showing hot gas in the cluster (from the ROSAT satellite). The size of IC3418 is magnified by a factor of 10 relative to the cluster, in order to make it easier to see. Research presented at the 222nd American Astronomical Society meeting suggests that the dwarf galaxy IC3418 has stopped making stars and that it is in the process of dying. A bright dwarf galaxy relatively close to Earth’s Milky Way and trailing fireballs is the first clear example of a galaxy in the act of dying, scientists argue in new research. The work gives a known galaxy new status and offers the potential for better understanding of the mysterious origin of dwarf elliptical galaxies, a subspecies of the universe’s most common type of galaxy. Kenney presented the research June 3 at the 222nd American Astronomical Society meeting in Indianapolis. Star formation is the essence of galactic vitality, and many of the universe’s known galaxies are active star factories. But due to gas depletion, many others have stopped making stars, rendering them in a sense lifeless. The subject galaxy — known as IC3418 and located deep inside the Virgo Cluster — is now all but totally out of gas, the researchers said. When there’s none left, the galaxy will no longer be fertile. “Stars, planets, and life can form only if a galaxy has gas to make them,” Kenney said. The Virgo Cluster is a mass of about 1,000 galaxies and the nearest large galaxy collection to the group that includes the Milky Way. In this process, the interaction of gases in the space between galaxies generates an enormous pressure that can force out an individual galaxy’s interior gas, while leaving existing stars untouched. 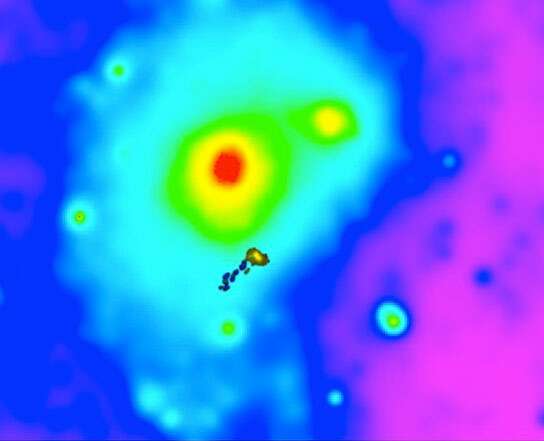 Ram pressure pushes gas away from the galaxy, forming stars that don’t feel the ram pressure and remain behind. The tail’s fireballs — bright blobs of gas lit up by newly formed stars — are clear signatures of active ram pressure, according to researchers. Star formation is occurring at the heads of the fireballs. The researchers used the WIYN 3.5-meter telescope in Arizona and the twin Keck 10-meter telescopes in Hawaii and performed both optical imaging and spectroscopy techniques. Previous studies by other astronomers have proposed that IC3418 is experiencing ram pressure stripping. The new paper provides additional evidence and new details, and explicitly makes the case that the galaxy is an example of a galaxy near death. The paper is titled “Transformation of a Virgo Cluster Dwarf Irregular Galaxy by Ram Pressure Stripping: IC3418 and its Fireballs.” It will be submitted to Astrophysical Journal. Co-authors include Hugh H. Crowl, William Dague, Marla Geha, and Pavel Jachym. 1 Comment on "Galaxy IC3418 – The First Clear Example of a Galaxy in the Act of Dying"
So strange, the gas leaving, what kind of pressure would be required to strip an entire galaxy of gas? That estimate just boggles the imagination. I suspect the gas is more likely attracted to — not leaving –another galaxy. Why? Because the bh at the galaxy center has become satiated, quiescent, stilled, non active, and non attractive to the gas. This then would be an example of the bh losing its attraction. Miles Mathis has some papers on the web referencing this effect.